It has been quite awhile since I posted an article, but I wanted to share an event which took place recently with spinning wheels and hand spinners. A group of spinners and weavers meet in Glor in Ennis, County Clare monthly. We unofficially call ourselves the Midwest Spinners and have been meeting together for about 5 years. We love to just sit, spin, chat and share ideas and experience with each other. The last meet up was 1 December and there were some interesting wheels present. One of our members is Swedish and recently traveled to her home there where she purchased a beautiful hand built 100 year old wheel. 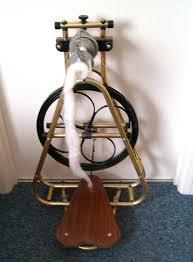 Look closely at the distaff, which is made from the top of a Christmas tree! Recycling at its best. Our members spin on a variety of wheels, like this vintage Louet. The owner is a very happy spinner and creates yarn in fabulous colours. Some of her hand dyed roving is purchased directly from a fellow member who sells under the label Babbles Yarn. This particular day, Grace had her Indian chakra wheel with her and was spinning away on it, making very fine cotton yarn. 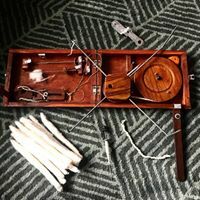 One of our members, Liz, owns about 12 spinning wheels and a recent and unusual purchase was a vintage Alpha wheel made for a short time by Frank Herring. It is a strange looking spinning wheel, but is easy to operate and spins as well as any traditional wheel. 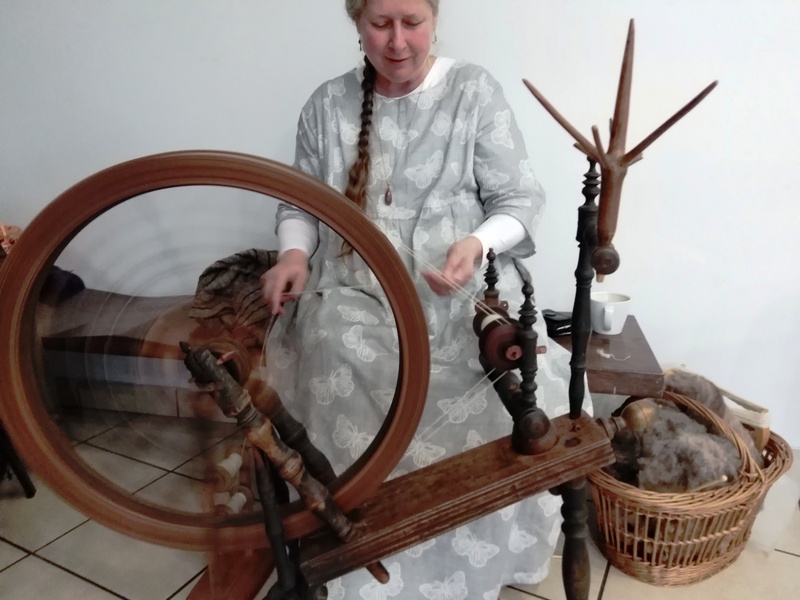 There have been many more types of spinning wheels used at our spin days, but there is always a traditional wheel or two present. 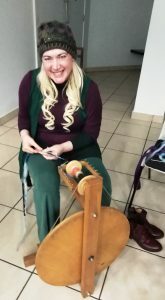 Here you have Sabine with her Ashford wheel with a skein of her natural wool wound on a niddy noddy. 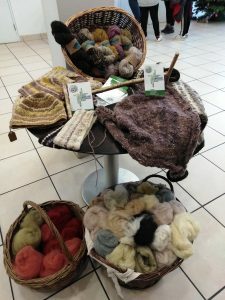 Sabine sells her Irish naturally dyed yarn and knitted items under the label Back to the Source. In this photo, she is wearing a jumper hand knit of Icelandic wool in natural colours. 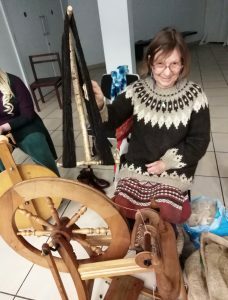 Besides wool, several of our members spin alpaca fleece which they can purchase from Valerie, a member who has Loophead Alpacas. 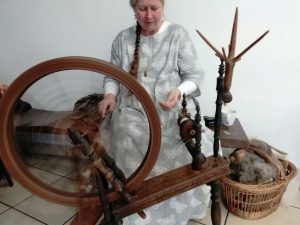 Valerie and her husband raise alpacas on their beautiful farm and the alpaca fleece they produce ranges in colour from white to browns to black. 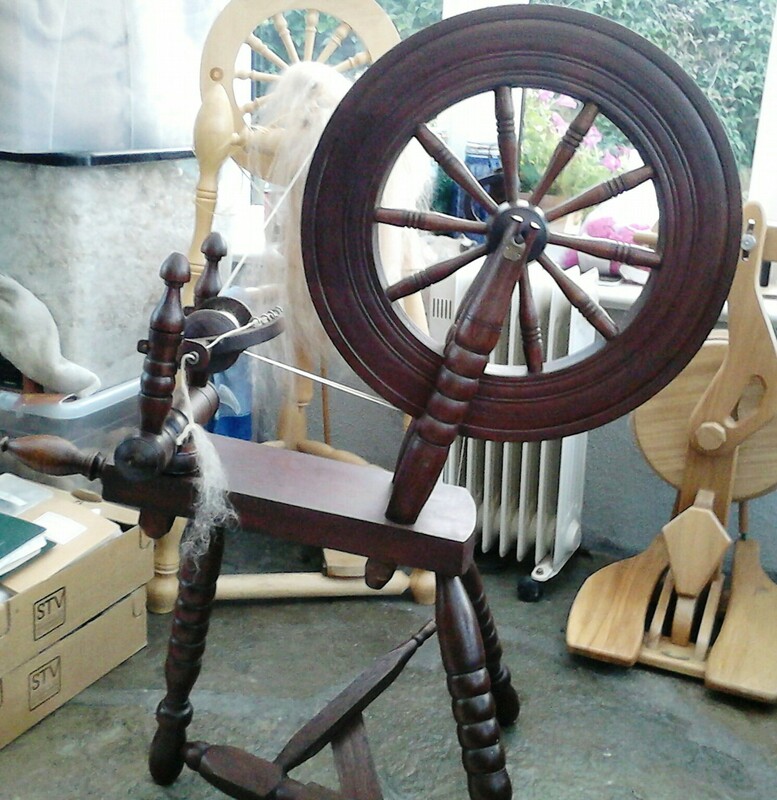 Valerie can be found spinning on her Donegal wheel, hand made by Johnny Shiels in Inishowen. We’ll be together again on the 12th of January, also at Glor, Causeway Link, Ennis. If you can stop by between 12-2 pm you may see one or all of these ladies there and who knows which wheels they will be using.